TeleSeal’s unique design enables it to be fixed to existing tiles or below new tiling, TelesSeal can even be fitted to misaligned tiles and deep grout joints and still provide the seal as desired. Strips are provided with pre-cut mitred ends to minimise installation time. A concealed adhesive strip locates the seal whilst the specially formulated sealing adhesive bonds the seal in place. Once the seal has been fitted any new tiling can be continued immediately. Unlike sealant or other fixed seals, there should be no need to fill the bath before installing. TeleSeal is easy to fit, by the professional or DIY user and is suitable for all flat topped bath/shower rims and work-tops. Fitting instructions are included in the pack, you can also view a video of the fitting process on our installation page or via You Tube. Our fresh design principles, coupled with modern manufacturing techniques and carefully selected materials mean we are able to deliver mass-manufactured, robust, water-tight seals that have universal fit and an indefinite life span. Each Pack Contains all parts required to seal a bath or shower tray. Standard Seal length: 2 x 1850mm including pre-cut mitred ends. Seal height: 22mm self adjusting to 32mm - fully extended. 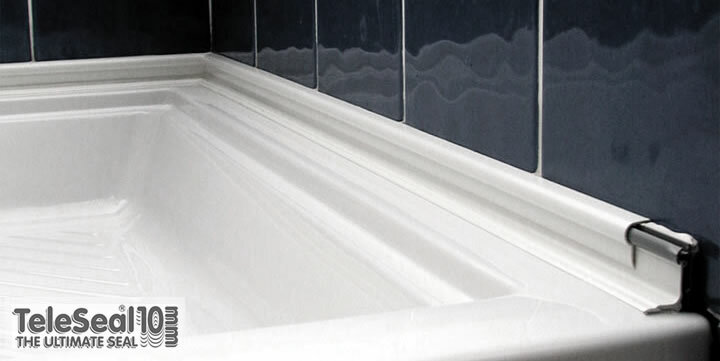 The UV stabilised uPVC extrusions form a neat, compact and telescopic assembly that appears as a discreet strip of trim on your bath or shower tray. TeleSeal has been developed from our proven award winning technology that finally enables the permanent and mould free sealing of baths and shower trays to the wall. TeleSeal’s unique design can allow up to 10mm of movement between the bath and the building structure, therefore preventing leaks during the life of your bathroom. This revolutionary approach to the movement of sanitary ware in the bathroom enables a permanent, life long seal that removes the unhygienic breeding ground of unsightly mould-growth.